Stelor is a contemporary Scandinavian interpretation of a traditional English dresser. Twin glass doors make Stelor an excellent display cabinet display cabinet while the bottom drawers provide space for items hidden from view. The door detail can be finished inlaid with leather or in brushed stainless steel. front is machined from the same piece of wood as the surrounding panel giving an unbroken flow of visible woodgrain. *Other surface treatments such as lacquer or paint finishes are available on request. 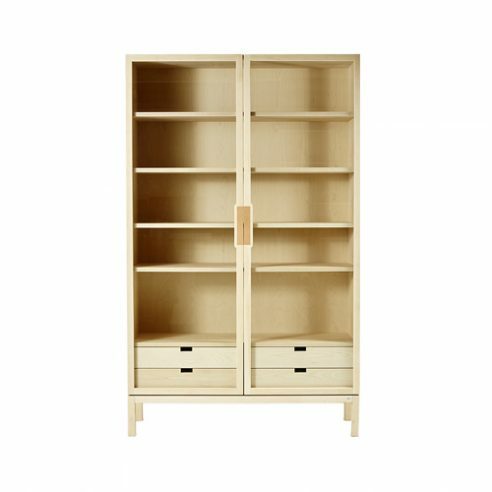 Each Stelor cabinet comes complete with five wooden shelves three of which are adjustable. The doors are opened with a simple push mechanism. For saftey each Övide unit should be anchored to the wall with the fitting supplied.